I like this image very much. The silhouette of the dog makes it interesting and fun. Awesome, you can see in the silhouette that the dog has fun! Also nice reflection of the sun on the Sea. 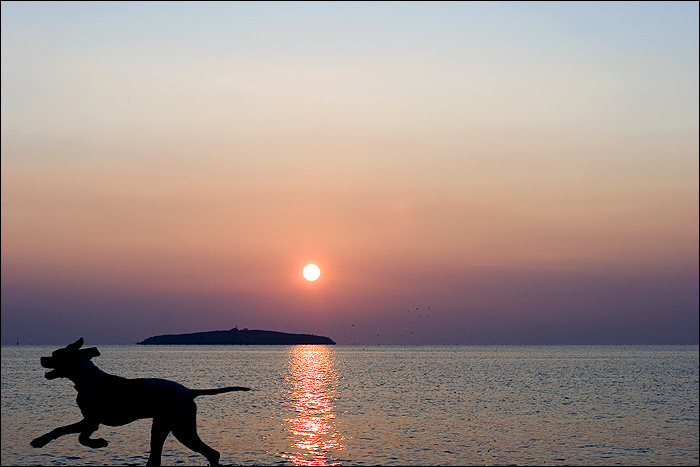 Nice shot … I love the reflection of the sun with the dog. A delightful silhouette and a good way to enrich an otherwise routine sunset shot. Watch your edges, however — you’ve cut the back legs of the dog off. If you had been able to include the ground beneath them, you would have enhanced the sense of movement. Funny! Good captured and fine colors.